Take a look at our monthly ezine. The latest colors and newest styles along with a note from Jolynn! If it's time to get new window treatments in your Daly City home, Drapery Works! can get you the custom Blinds, Shades, shutters or drapes that will fit best in every room. Our mission is to provide you with window coverings that are tailored to suit your practical needs and your aesthetic preferences. You shouldn't be adjusting your wants or your rooms to fit the window treatments. It should be the other way around. We have a wealthy of expertise in the fabric arts that we offer our clients. From design to construction to manufacturing, we make sure you get the best of the best for your window coverings. Be it Blinds, Shades, shutters or drapes you want, you can be sure they'll be of the highest-quality. As an authorized Hunter Douglas representative, we can bring the products of the industry's leading manufacturer into your Daly City home. Give us a call here at Drapery Works!, and let us know about your Daly City home project up front: how many windows/rooms, what styles you're looking for, any specific fabrics or hardware you have in mind, overall budget. We'll come out and do a free, in-home consultation for you. Then we'll get the ball rolling towards those perfect Blinds, Shades, shutters or drapes. 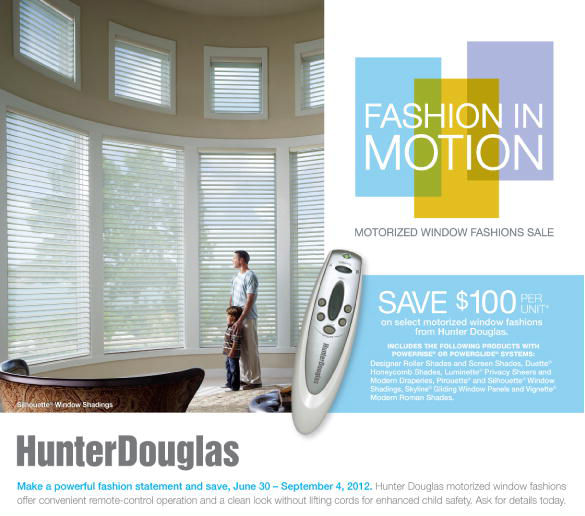 As an authorized Hunter Douglas representative, Drapery Works! brings to each client best-practice principles of design, up-to-date style expertise, along with significant experience and product knowledge. *Online 20% discount applies to orders over $2000.00.